Ship Sticks, which provides a revolutionary new web-based service for golfers to easily and affordably send their golf clubs to their playing destination, has joined the Golf Retirement Plus™ program as a supporting partner. Ship Sticks' service is a safe, secure, reliable and cost-efficient solution for seamless pickup and delivery of golf clubs that can be placed by either PGA Professionals for their members and guests or by the golfers themselves. The mission of Ship Sticks is to provide value-added services to the golf industry to make golf travel easier and more affordable, thus increasing the number of participants and rounds played annually. "The PGA of America is delighted to have Ship Sticks on board as a Golf Retirement Plus supporting partner," says Allen Wronowski, PGA President. "Ship Sticks is changing the way golfers travel, as no longer must we carry our own clubs through airports, in rental cars and in hotels. Instead, we can now log on and ship them to our actual playing destination where they are waiting for us via the Ship Sticks delivery service." Founded in 1997, Golf Retirement Plus™ is a retirement program for PGA Professionals and apprentices, GCSAA Superintendents and CMAA Club Managers, which allows them to make their own contributions or have their employers contribute to their Golf Retirement Plus account on their behalf. PGA Professionals may also earn personal incentives by participating in the Golf Retirement Plus Partner Programs. "Ship Sticks is very excited to offer a service and savings that will not only benefit all traveling golfers, but the PGA Professionals who assist them as well," said Nicholas Coleman, CEO, Ship Sticks, in West Palm Beach, Fla. "There is inherent value in providing a service and solution when and where it is truly needed. 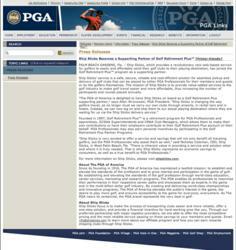 That is why Ship Sticks represents an economic savings to consumers, as well as a true benefit to PGA Professionals." For more information on Ship Sticks, please visit shipsticks.com. Ship Sticks focus is to make the process of transporting clubs easier and more reliable, offer a one-stop solution, and provide a financial incentive for hard-working pros like you. Through our preferred partnership with major logistics providers, we are able to offer the most competitive pricing and the most reliable service passing on those savings to your members and guests. Email info(at)shipsticks(dot)com to learn more about our affiliate program and how you can earn rewards shipping clubs through Ship Sticks.